The PhD Year 4 Marketing students of the University of Ghana Business School donated sixteen (16) swivel chairs to the University of Ghana Business School on 13th December, 2018. Accepting the swivel chairs on behalf of UGBS, the School Administrator, Mr. Emmanuel Poku-Sarkodee expressed gratitude to the students for their support and tremendous generosity. He referred to the donation as an immense gesture and hoped the act would eventually translate into a sustained relationship of mutual benefit to the School. 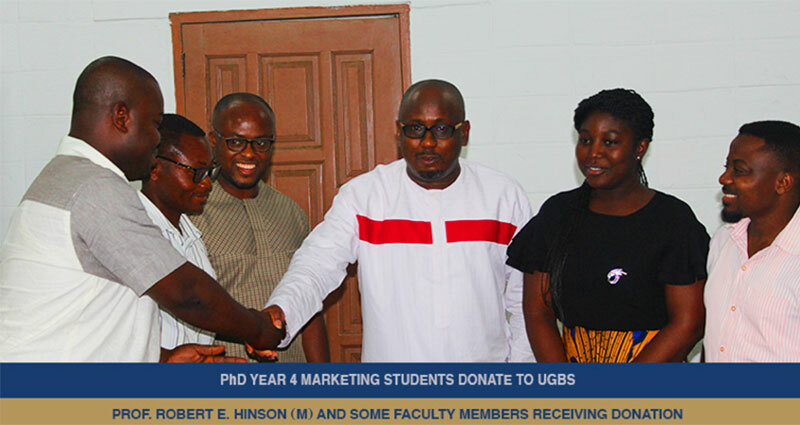 Present at the ceremony was Head of Department of Marketing and Entrepreneurship, Prof. Robert Ebo Hinson, who facilitated the donation and assured the donors that appropriate care will be taken to ensure the items last for generations. Dr. Odoom and Dr. Dorson of the Department of Marketing and Entrepreneurship and some staff were also present. The swivel chairs will be used in a study lounge for Post Graduate students of the University of Ghana Business School.